Well there isn't one yet because we are living in between homes. First I'd like to preface this post saying this is a rebuttal for the somewhat viral post on how awful elves on the shelf are. If you aren't Mormon, then you are less likely to have read it. But you can because it has nothing to do with the church. And she is a hilarious writer. It's worth a read. Anyway, you can read it or you can not read it. It doesn't really have anything to do with my thoughts except towards the end where some of my complete bewilderment in the form of rage comes out. Remember how last year the hype started with the elves on the shelves? I remember seeing pictures all over the interwebs, mostly on Facebook, with pictures of naughty elves doing crazy things! I loved seeing the pictures. It made my smile and then frown because I didn't have one. I was a little jealous. It was an after-Christmas special at Hastings. Because it was no longer the season for the elf, I put him away on a shelf in a box. I still haven't opened it. And I've never read the book. And probably never will. But we will participate in elf happiness. Because it's meant to be fun! 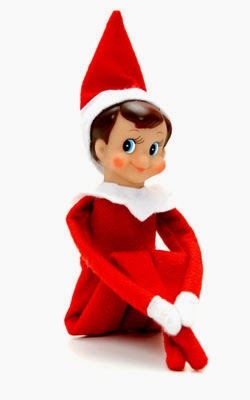 As a child I remember an elf being a part of our holiday décor. It was probably an original because he was old and frayed and still creepy as ever. I always thought he was an ugly little bugger. And I wondered what he was doing. He looked so out of place what with his crazy eyes. BUT he was there every year. And I believe I even saw him last year at my moms house in her entertainment center. She never read us the book though, we were not persuaded to be good because of the elf. He didn't shred toilet paper, or spill milk or do other such things. He was there as a decoration and now as an adult, I'm sure for nostalgia on the part of my mom, and for me too. Therefore, I am going to implement an elf in our house. We don't have many traditions yet and I think this will be a fun one. I am way too lazy to even create a board on Pinterest dedicated to elf ideas but I might move him around from time to time. And I might even use him as an excuse to get my kids to behave better. About that. You're telling me you've NEVER used the "Santa will bring you coal if you don't behave?" If you haven't, then maybe you're the bad parent as the author so slyly accused us of. You're not doing your job, if you don't use Christmas/Jesus/Hanukah as a reason for your kids to behave during this holiday season. There I said it. And I'm joking. But it kind of sounds legit right? Because if you don't then you're just giving kids crap for being what? Being alive? Yeah right. Christmas is TOTALLY a time to get the best behaviour out of your kids when the rest of year there's nothing else to hang over their heads. Hahahaha. I totally hate myself for saying that. And I don't believe it. 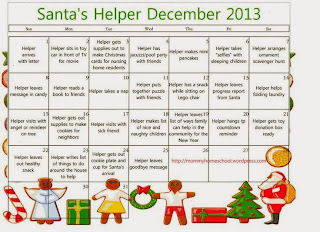 But I do think this is a special time of year specifically for the reason that kids seem to have good manners and do good deeds because even if you aren't inundating them with threats of Santa not coming, the rest of the world is. You're kid gets asked all the time if he or she is being good. It's happening to them at school, and at the grocery store and at Church. Not unimportantly, it follows up the dreadful message from Twitlight that it is perfectly acceptable for some creature to come to your house and watch you sleep if they claim that it is for your benefit. I'm not prepared at this time to go into how much I REALLY disagree with all of those statements. Except for the Twilight one. That's super funny. But I'd like to know what you think. So please share. I hope you've read the article by now. Because this is where I'm totally baffled and I'd like to refute a few of the articles other statements. Well first she says, "Be the magic yourself." 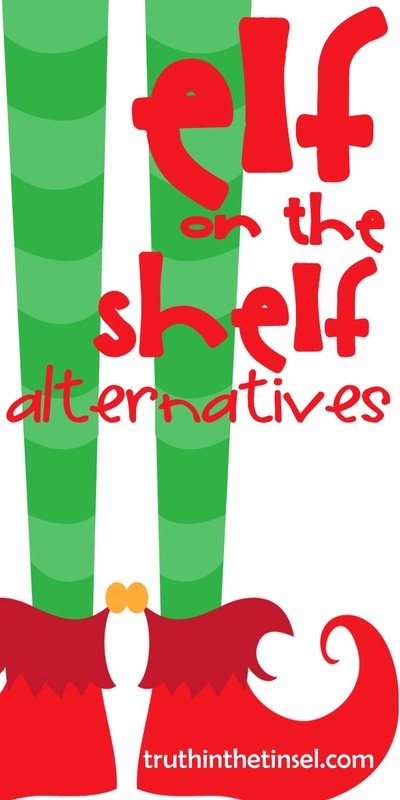 I'd like to use this in favor of doing an elf on the shelf if you have one. The Elf is a totally easy and lazy way to create magic at your house. And then there's this statement, "The minutes you would have spent on a prank are so much better spent with your child." And then she lists some really great ideas for using those minutes. The thing is though, I'm pretty sure the Elf does his business when the kids are asleep. Otherwise, what's the point? And I'm pretty sure I don't want my kids up at 10 o'clock catching snowflakes or drinking liquid sugar. I'm not encouraging you moms and dads to add more to your plate, but I am encouraging you to think outside the box. You don't have to do cray cray things with the elf. Maybe you could implement alternative ideas for the Elf on the Shelf. I love this idea. This family loves reading. 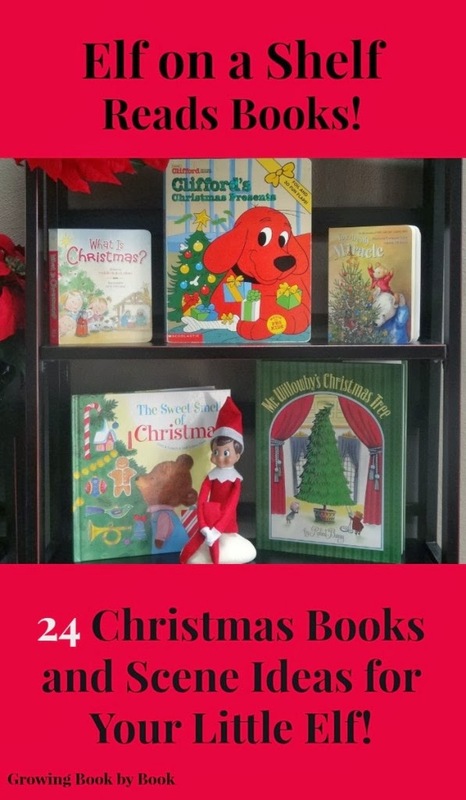 So every day the kids will wake up and the Elf will be near/on/around a different book! Fun! 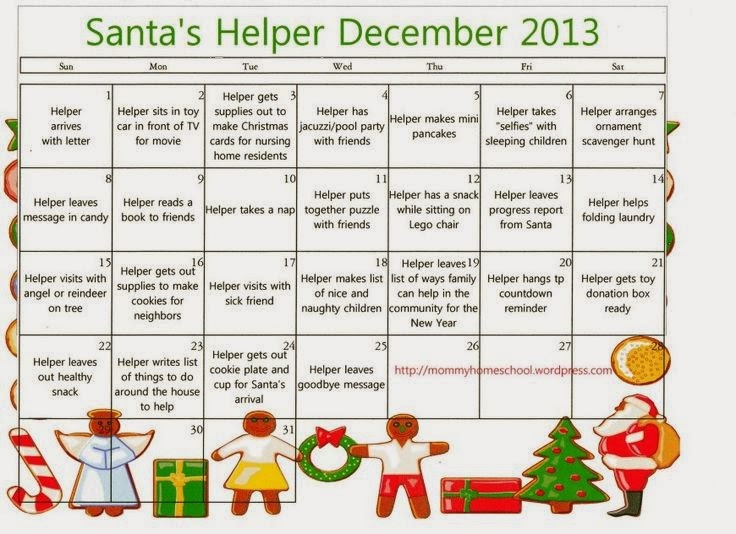 This really crafty mom created this Calendar that includes good ideas for the Elf on the Shelf. Service ideas! No naughtiness! See! It can be done! These are all completely non-elf related. Which is totally a possibility! I think I might incorporate some of these with the elf. Possible! Or if you need a good reason to tell your kids why there's no Elf, you could tell this story. Pretty hilarious. Anyway, this is the end of me on my soapbox. I know that I am but one, and this is one's opinion. Please share yours too! Lisa, I know you don't want to hear this but your copied bullet points can be attributed just as easily to your God. But then I used to keep a piece of paper on the fridge and every time one of the boys misbehaved big I'd make a huge production out of making tic-marks and threatened to send it to Santa. I don't know how to reply to your comment specifically. I should figure that out eh? lol. Anyway, I would agree that many peoples God could be seen the same way. However, not mine. I refuse to believe in a God like that and I know/have seen/felt otherwise. :-) I do feel bad for those who see him that way. I want to be kind here. All people deserve the benefit of the doubt. I'm just sitting here trying to figure out how someone could associate God with those bullets. The God I know is constant, perfect, loving, forgiving, and just. He may watch over you as you sleep, but His spirit is love and peace. Entertainment and novelty have absolutely nothing to do with my faith, and I believe that goodness comes from within. Don't be silly. God is not an elf.